Steal the show and paint that sky this New Year's Eve and Bonfire Night with our retina- frying range of award winning fireworks bursting out of our stores all year round! These eye popping 'Ooo' makers featuring the award winning Brothers Pyrotechnics, awesome Absolute Fireworks or make the galaxy green with envy with our Bright Star Fireworks! Packing more powder than Guy Fawkes and with more bangs than Rambo we're proud to house the biggest baddest selection of Fireworks anywhere on the South coast! Whether you want to bring a little magic to New Years or bring history to life on Bonfire Night.. We've got everything from the versatile family selection boxes for those garden parties that need a little something louder to a truly epic sky- splitting display! Watch our Roman Candles in awe, jump at our Mines, Oo ahh and ee at our Barrages, indulge your sweet tooth for things that go bang with our Cakes, watch our Fountains frolic and stand well back from our night- frightening Rockets like Brothers Pyro-Collect in Store Only !! 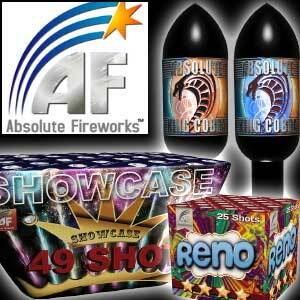 Hollywoods shops stock a huge range of fireworks for sale all year round that include all types of fireworks such as rockets, single ignition barrages, multiple shot barrages, cake barrages, rocket packs, barrage packs, fountains, mines, sparklers, roman candles and even sky lanterns! There are shot barrages from as little as 8 shot barrages to as huge as 4000 shot barrages with all matter of colours emulating from the colourful fireworks. Whether it is a garden party, birthday party or bonfire night then check out our range from the leading manufacturers such as Absolute Fireworks, who stock the awesome King Cobra rockets, the award winning Brother Pyrotechnics Fireworks and for budget and a large choice of family fireworks check our Bright Star Fireworks all at cheap firework prices, so light up your night with some coloured firework effects and loud bangs are optional! So Click and collect in store today from either of our 2 Bournemouth shops or our Queensway, Southampton shop and be amazed by the price and selection. 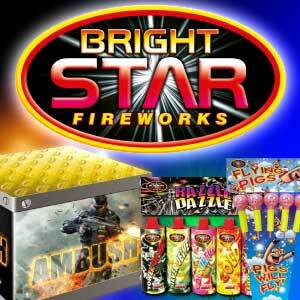 Fireworks to either click and collect in store or go in store to view the huge range on offer. Hollywood offer a vast range from the leading manufacturers to give you a great night of spectacular effects. ROCKETS from Hollywood Fireworks offers a selection of rockets from small rockets to BIG rockets, so if you want your Guy Fawkes night to go with a small bang or large boom you know the perfect place to come to reach new heights !! Absolutely Brilliant !! The only words that will come from your lips when you ignite the big bang rockets, single ignition fireworks, barrage cakes and even the Halloween sky lanterns have a lovely evil glow !! BARRAGES from Hollywood fireworks include single ignition barrages, cakes and other small and large barrages which are a fantastic way to start or end any party. From small bore to big bore, from 16 shot to 4000 shot they are all available now to buy in-store or reserve and pay on-line to avoid disappointment !! 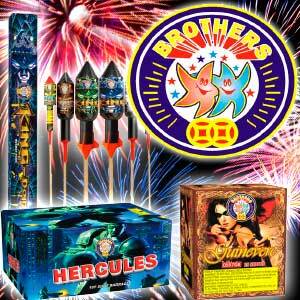 Brothers Pyrotechnics have pyro-galore of exquisite rockets, single ignition barrages that will raise the roof and colour your soul, Catherine wheels that will make your head spin and barrage cakes that cook up some great effects! SELECTION BOXES from Hollywood fireworks include boxes that come in all shapes and sizes but most of all whatever the size there is sure to be a selection box for any fireworks night in your garden ! Like a shining star burning brightly at night the selection of fireworks available from Bright Star Fireworks is tremendous and includes mines, fountains, selection packs, single ignition barrages, rocket packs, firework cakes literally anything from a garden party with children present to a lads/ladies night who want all the big, bangs and oomph possible.